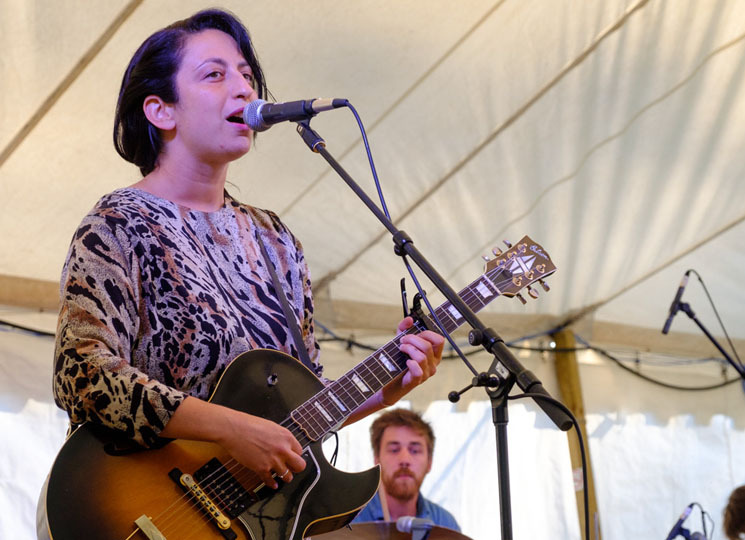 Vancouver's Ora Cogan brought her incredibly mellow, atmospheric electronic blues to Hillside for the first time on Friday, singing songs from her Shadowland album and songs from an upcoming new album called Crickets (due out this fall). Cogan's Mazzy Star-like folk is backed by electronics instead of acoustic guitar and banjo, and she played as a trio with a drummer and a shimmery top-clad synth player, her plaintive, delicate voice hovering over her warm finger-picked electric guitar. Her songs are by nature dreamy and mysterious — about lost love and lonely strange moods experienced in the forest — but her Hillside set came across as too introverted, Cogan's lyrics almost impossible to decipher as she sung with eyes closed and with abundant reverb. Whether out of an artistic preference for vocals to be low in the mix or out of shyness, it made the set difficult to engage with. By the end of the set, Cogan was singing with more confidence: "The Light" from Crickets came across more clearly, Cogan setting aside her guitar and playing egg shaker. She did some cool looping of her voice and seemed to relax a little when she shifted gears to finish with a cover of Karen Dalton's version of "Katie Cruel."